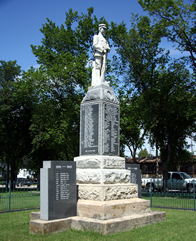 Manitou’s Cenotaph joins the family of Manitoba’s Municipal Heritage Sites! Municipal Heritage Sites are designated under The Heritage Resources Act. Heritage sites designated by the City of Winnipeg are listed on the City of Winnipeg website. Manitoba’s Municipal Heritage Sites and the City of Winnipeg’s heritage sites are also presented on a website developed by the Manitoba Historical Society. To view an interactive map of Manitoba's historic sites, museums and commemorative markers, visit the Manitoba Historical Society - Historic Sites of Manitoba website.